I’ve been so impressed by lagaleriademagdalena’s events and projects ever since anA posted her exhibit last year on facebook. The two young Madrileñas behind this urban street gallery are architects Reichel Congosto and Isa Arenas who came up with this wonderfully innovative concept two years ago while wandering through la Calle de Magdalena in Madrid and coming across a building construction site with large rectangular test color swatches painted on a wall that reminded them of art displayed in a gallery. They quickly seized the opportunity to place artworks within the rectangles and thus began lagaleriademagdalena. The gallery’s (who says a gallery has to have four walls?) pop-up exhibits foment community and interactivity. Everything that is exhibited is there for the taking; they call them “regalos urbanos” (urban gifts) and one of the main motivations behind las magdalenas’ efforts is to give the public the gift of happiness. Plus, the exhibits are smart, creative, and fun. Some created by Reichel and Isa themselves, while others are collaborations. All involve recycling of objects, some involve social activism, and all bring a smile to those who pass as well as pique their curiosity. 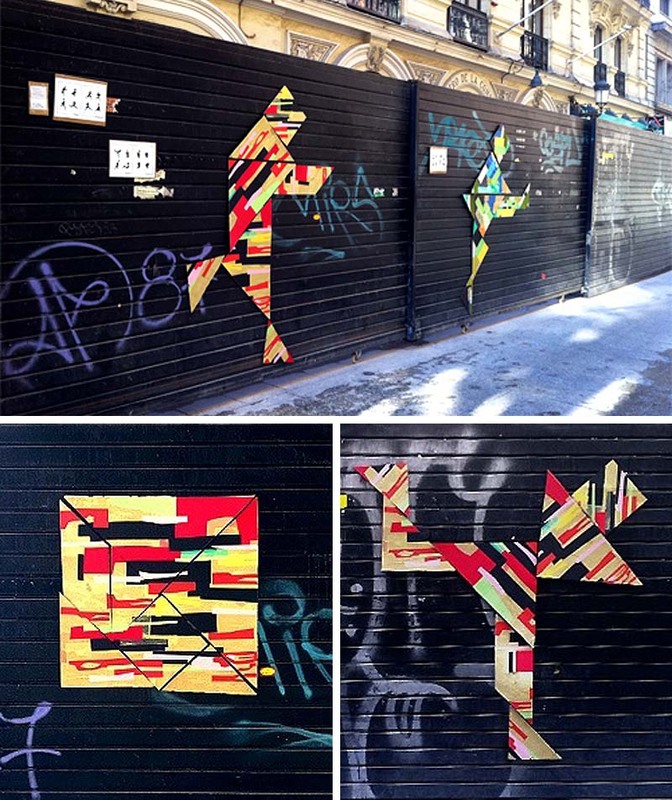 The ephemeral exhibits usually occur on metal shutters or walls in construction sites, attaching the works magnetically, avoiding harm to the walls and allowing for easy removal and replacement by passers-by which also makes the interventions vandalism-free, allowing them to occur in the light of day, unlike most street artists. 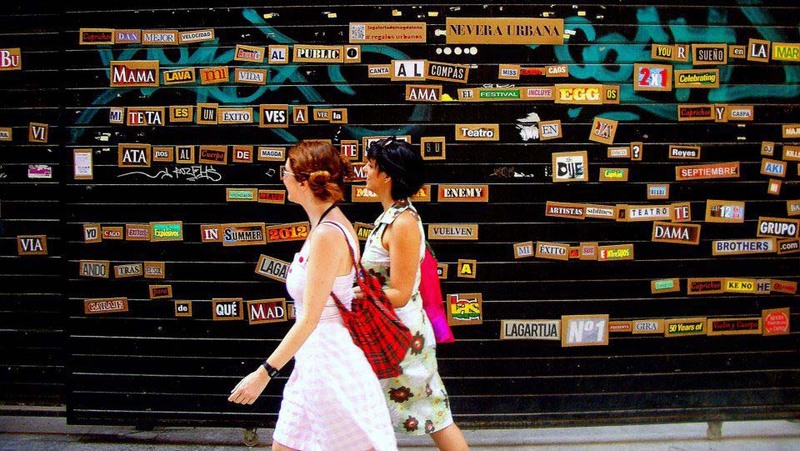 One of their exhibits made up of cut-out words from various old periodicals was titled Nevera Urbana (Urban Fridge – top photo) urging the public to play with the words like magnetic poetry on your fridge. The exhibit Tangrams (bottom three photos) offered similar play. An example of a more seriously themed exhibit would be Contra la violencia de género (Against Gender Violence) where egg cartons were used to house images of the many layers of a woman: their beauty, emotional strength, intelligence, death as well as a mirror to remind the viewer that they are the ones reflected in the box. This month lagaleriademagdalena celebrated their two-year anniversary with their 53rd (these ladies are busy!) exhibit: #EnCinta (2nd through 6th photos). 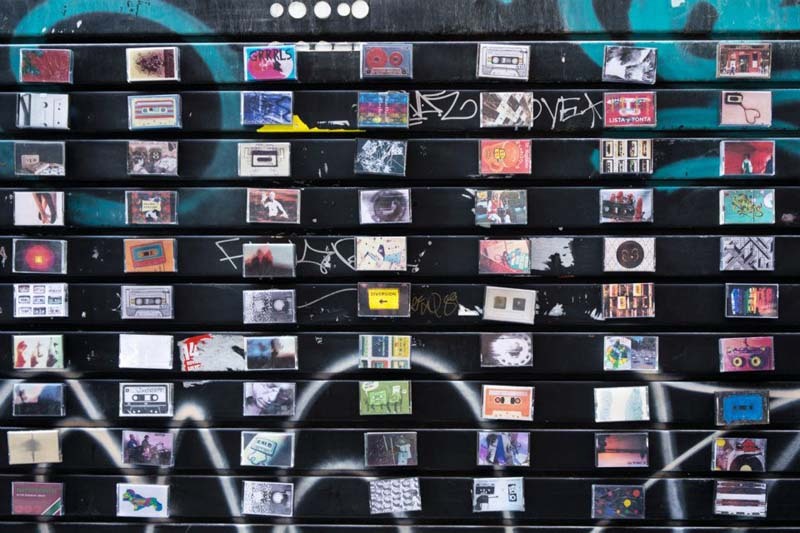 A wall of cassette cases with inserts designed by the participating artists also included their playlist with a link to it on a special lagaleriadelamusica site set up by las magdalenas and audible via spotify or grooveshark. In addition, each case had a little spool of recycled cassette tape. The intervention was a huge hit with an impressive turnout, everyone inspecting the cases and lists, with all of the urban gift cassettes disappearing rather quickly. Seems that many in-the-know have started to collect these artworks. There are many, many more exhibits to see and read about on their website and blog. The charming magdalenas (interview video in Spanish here) and their transient gallery are definitely ones to watch. They have grasped the true meaning of “public” art. Bravo!